Belfast Giants have signed Canadian forward John Kurtz for the new Elite League season. The 28-year-old becomes the final addition as head coach Adam Keefe completes the 2017/18 roster. 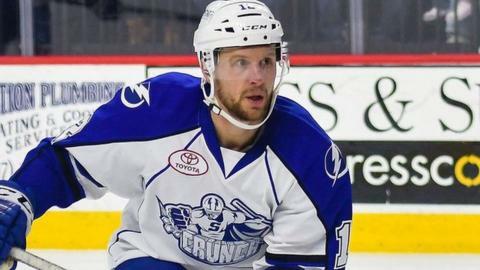 Kurtz arrives following a season split between the AHL and ECHL with the Syracuse Crunch and Norfolk Admirals. He posted impressive offensive numbers while in the OHL with the Sudbury Wolves - 71 goals and 72 assists for a total of 143 points in 251 games. Kurtz was selected for the Mickey Renaud Captain's Trophy during the 2009/10 season. The award is for the "OHL team captain that best exemplifies leadership on and off the ice, with a passion and dedication to the game of hockey and his community". "John is another exciting player to watch and another guy who has a compete level that is off the charts," said Keefe. "He knows how to handle himself physically and he is not afraid of the tough stuff. If you take a closer look at his numbers he has proved he can play and contribute offensively." "This is a long gruelling battle for eight months to get to the league title and the team that competes the most consistently is going to be there at the end and that is what we want." The Giants start the season on Saturday night with a Challenge Cup game against Dundee Stars.